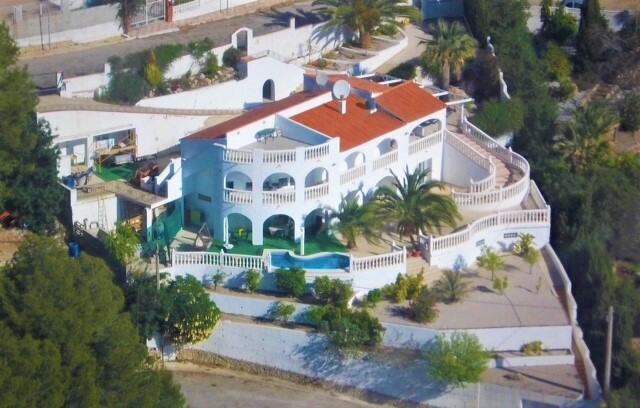 Impressive 5 bedroom Villa for sale in Oliva situated on the beautiful Costa Blanca. Placed in the Tossal Gros area of Oliva and nestled on a plot of 1105m2 with a build size of 292m2 this adorable property boasts incredible views over Oliva and beyond. Enjoying a sea view along the coast from Oliva to Denia, including the Isle of Ibiza to the East and across to the mountain range of the Gallirinas to the south, with the nature reserves of Montgo and the Marijal de Oliva all can be enjoyed within the peace and tranquillity of your own surroundings. The approach to this dwelling is by a single gate with steps that lead into a garden, or it has the luxury of two separate entrances both with electric gates that enable you to drive in one and out of the other. The drive is spacious enough to accommodate a few cars as well as housing its own carport. The entrance to the main floor is via a large reception area which is part of the upper terrace, surrounded by a pretty white balustrade and spacious enough to accommodate seating, it is a fantastic area to relax or enjoy dining ‘Alfresco’ whilst absorbing the beautiful views this property has to offer. Double doors take you to a spacious living area also with fabulous views, adjoining an open plan kitchen/dining area, boasting a fully fitted kitchen with matching base units, dishwasher, washing machine, large fridge freezer, electric oven and induction hob with overhead extractor fan. This modern kitchen was designed with great care thus stylish with ample storage. The main floor boasts a Master Suite that comes complete with a fitted super king-size bed with storage, double glazed doors that open onto a terrace overlooking the pool, perfect for enjoying a morning coffee/tea whilst absorbing the breathtaking views that surround this luxurious villa. The Master Suite benefits from a dressing room with automatic ceiling light, vanity unit, mirror and lighting, fitted storage units and an ensuite bathroom that includes a kidney-shaped Jacuzzi bath, large mirror, shower cubicle, built with blue modern glass bricks, hand basin with fitted cupboard, mirror with lights and shaving point. The second bedroom is a double room with an ensuite bathroom. The entrance to the lower floor/ apartment is by way of double glazed doors that open into a fully fitted kitchen, it has ample storage with two carousel cupboards, electric oven, gas hob with a pretty decorative overhead extractor fan unit and benefits from a microwave, washing machine and fridge freezer. The kitchen opens into a living area all with double glazed windows and doors allowing both rooms to be bathed in sunlight. The apartment comprises of another three bedrooms, two double rooms (one with an ensuite) which has access to an outside terrace area, a single room, a family bathroom and an additional room currently used as storage but could be used as a six bedroom. Here you can access the garden area that presents a unique teardrop-shaped pool that comes complete with two seats to enjoy the Jacuzzi air and water jets, this pool is very sleek featuring a water resistance swimming system. A beautifully designed garden surrounded by stylish white balustrade features plenty of seating areas, a 3 hole putting green, a built-in barbeque with a smoker, fitted into a feature wall, imitation grass, an outside shower, lemon orange and pear trees and two outstanding palm trees giving the garden a real tropical feel. There are lights surrounding this Villa making it easier to wander around at night or to enjoy an evening swim or entertaining! A spacious roof terrace offers plenty of room to accommodate a seating area and perfect for a magical night time view over the illuminated city afar. The grounds of this wonderful abode are beyond words with underground storage rooms to a hidden garage with access onto a side road. There is certainly more than meets the eye! The property benefits from mains water and electricity, double glazing, a sophisticated alarm system, cavity wall and ceiling insulation throughout the building, electric locking persianas, wired internet network system throughout giving a very good network/WIFI connection, television, and has all heating pipework pre-installed for central heating. Currently divided by two separate floors, within the dining area upstairs and the hallway on the lower apartment there are hidden stairs making this ideal to join both floors and use as a family home if desired. It is a 10-minute drive to Oliva town where you will find all of the amenities that you need and a 15-minute drive to Oliva beach or can venture to the beautiful blue flag beaches of Gandia within 20 minutes. Oliva Nova Golf Resort is a 20-minute drive and there is an opportunity to enjoy sailing/watersports at the beach. Alicante airport to the South is 118kms and Valencia airport to the North 86kms. This is truly an exquisite property with so many extras to be enjoyed and would suit a permanent/holiday home or attract someone looking to live on the main floor and rent out the lower apartment and use as rental income. A very welcoming home that has a feel of paradise! Access to property, electronic persianas, two ceiling fans. Fully fitted kitchen with a range of matching base units, large storage drawers, two carousel cupboards, electric oven and induction hob with overhead extractor fan, dishwasher, washing machine, large fridge freezer, window with view, aerial point for television. Super kingsize bed with frame and storage, two double glazed doors, access to balcony, two ceiling fans, aerial point for television. Automatic ceiling light, vanity unit with lights, large mirror storage units. Kidney shaped jacuzzi bath, large mirror, blue glass brick built shower cubicle with shower unit, W.C, hand basin with fitted cupboard and mirror with light, shaving point. Blue glass brick built shower cubicle with rain shower, glass screen, hand basin with fitted cupboard, large mirror, heated towel rail, W.C, bidet. A range of matching fitted base units, carousel cupboards, electric oven, gas hob with decorative extractor fan unit, microwave, washing machine, fridge freezer, access to outside terrace. Three seater sofa, two chairs, a table and chairs, two fans, views, access to an outside terrace. Double bedroom, large glass mirror, fitted wardrobes, ceiling fan, access to outside terrace, views. Walk-in shower cubicle, glass door, W.C, hand basin, mirror with light, heated towel rail. Double bed, bedside tables, two double wardrobes, storage unit, ceiling fan, views. Single room, bunk beds, pine wardrobe, shoe rack fan, air exchange fan. Family bathroom, bath, shower, shower screen, W.C, hand basin.